Ford’s Mustang turns 50 this year and you’d likely have to be dead not to know that by now. A new 2015 model is being previewed at all the major car shows now and the mainstream media has been agog over 50 years of Mustang since at least January. 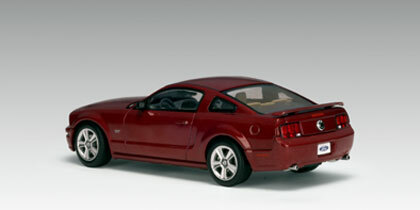 But if not for the 2005 revision of the famous pony car, Mustang might not have been around for its 50th Anniversary. Back in 2004 a new Mustang GT show car toured the country’s auto shows to re-launch, in a way, the Mustang brand, whose sales had slipped. Just two years earlier Chevrolet had pulled the plug on its Camaro, long Mustang’s chief competitor. It returned to Chevy’s lineup in 2010, at least in part to the Mustang’s resurgence. 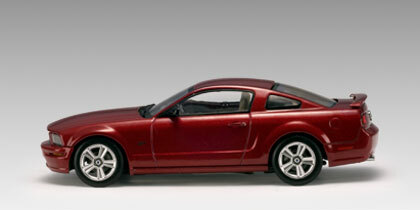 So when you look at the 2005 Mustang, you see the fastback styling of the iconic late 1960s models, the GT, Mach 1 and Boss. This was the re-design that re-established Mustang in the market and led to stellar models up through the present. 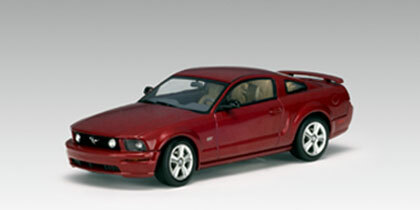 Autoart delivers this somewhat historic Mustang now in a high-value 1:43 scale version painted a “red fire,” sparkling metallic red, with black window trim. It’s modestly priced at just $35.90 MSRP. That’s a bargain in today’s diecast market. Make no mistake, this is nothing fancy (hood, trunk and doors do not open). This is just a precise execution of a popular model at a reasonable price. Pluses? That’s easy, the well-shaped body with its long nose and sloping fastback, plus small wing on the trunk lid. This looks perfect in profile and the black window framing, plus black mirrors, accentuate the car’s lines. No, you can’t pop open the hood to see its engine, but at this price you wouldn’t expect that. What you get are realistic looking headlights, including the two round accent lights on the blacked out grille that features a silver pony in the middle. In back the trademark three-bar red taillights look great and there’s a medallion on the trunk’s face along with a reflective strip at the lid’s edge. Down low are twin chrome exhaust tips. There’s GT badging on the front quarter panels and handsome five-spoke wheels with glistening silver disc brakes visible behind them. Most surprising, at this price, is the well detailed interior, tan seats and gray dash top. While it’s not hard to get well shaped seats in this smaller scale, it’s rare that a dash looks this good, unless the model runs north of $60. There are gauges and air vents with chrome-look trim and a realistic looking center stack and console, complete with shifter and two cupholders, plus a 3-spoke steering wheel with silver spokes. The result is a sharp looking Mustang for modest cost to fill a gap in your collection. Plus there’s some history here, this being the show car that got pony car fanatics revved up for a Mustang revival that carries over to the new 2015 model. Can’t wait to see the next plastic, resin or diecast version of that 2015 too!